I don’t blame the Wicked Witch of the West, I wanted those ruby red slippers, too. The first time I saw them I was lying on the floor in my family’s den, watching the annual telecast of The Wizard of Oz on television. Back then, you could only really ever see it once a year. Cable TV wasn’t even a thing yet, and it would be decades before Ted Turner bought the rights to the movie and started saturating his first network with multiple showings. It was those annual TV airings between 1956 and 1974 that made it the American classic it is today. According to the Library of Congress, it has been seen by more viewers than any other movie of the twentieth century. I’ve never seen a professional stage production, so I wondered how it could possibly do justice to the movie. So many movies that get a Broadway show treatment are so disappointing. When it was announced as the opening show in this year’s Broadway Live at the Opera House season, I started to doubt it could be successfully done. The Wiz? Sure. Wicked? You betcha! But a literal translation of the original 1939 movie into a stage production? I had my doubts. But then I found out that while the 1939 Metro-Goldwyn Mayer film is the best-known dramatization of the Wizard of Oz, it was not the first production. The first adaptation was, get this, a staged version! In June 1902, two years after the publication of the book, the author L. Frank Baum adapted his own work into a musical comedy. The extravagantly mounted production featured costumes designed by the illustrator of the 1900 print version. After a successful run in Chicago, the 1902 production transferred to New York and became one of the greatest successes in Broadway history at that time. Who knew? The Wizard of Oz that plays here in Lexington October 27-29 is a sparkling new national tour of the 1939 film version. It comes from Prather Entertainment, the company that brought the outstanding national tour of PIPPIN to town last season. And in case you didn’t notice those dates? That’s HALLOWEEN WEEKEND! Perfection. I have but a few short weeks to find a pair of ruby red slippers in a men’s adult size ten on Amazon. BROADWAY INSIDER Tidbit: In the original book and stage production, Dorothy’s iconic slippers were silver, not ruby red (gasp!). The designers of the 1939 film made them ruby red to further highlight the newest innovation in cinematography, Technicolor. This article also appears on page 17 of the October 2017 printed edition of the Hamburg Journal. 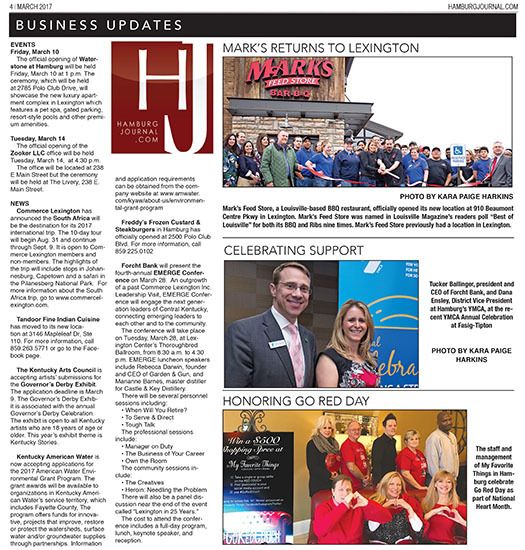 For more Hamburg area news, subscribe to thee Hamburg Journal weekly digital newsletter.